Peter LinWe are delighted to welcome back Peter T. Lin to our society. Peter is one of our favorite speakers who will be talking about the Genus Dendrobium. He will present a fast paced PowerPoint presentation on this fascinating genus of over 1000 species! The title of his presentation is "Genus Dendrobium: a Family Portrait of Dendrobium Species"
Dendrobiums are primarily found in Asia, New Guinea and Australia. There are many different classifications within the genus, with species ranging from tiny miniatures to huge giants. They grow in climates ranging from hot and steamy lowlands, cool and moist mountain ranges, to seasonally dry savannas. Many are quite temperature tolerant and can be grown outside in frost-free areas. Peter will review a few of the important species in each classification. He will provide some basic cultural advice for each species, and there will be time for questions at the end of the program. Peter started growing orchids over 35 years ago, but then stopped due to school and starting a career. It wasn't until about 14 years ago that the orchid "bug" came back and he is now heavily involved once again. He is an accredited judge with the American Orchid Society and a hybridizer of mini-catts. He enjoys meeting with other orchid enthusiasts, and can often be found at various orchid shows and societies around the country. He also has hundreds of photos of his orchids that he maintains on Flickr. 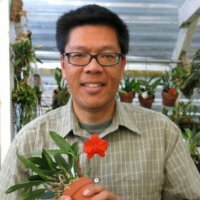 Due to limited growing space, Peter likes to specialize in miniature orchids, both species and hybrids, and has received numerous AOS awards. His other interests in orchids include Dendrobiums, Angraecoids, and Neofinetias. He maintains a collection of a thousand or more orchids at his home in Southern California in 3 small greenhouses, as well as an offsite greenhouse. Peter maintains a website with info on some of his plants offered for sale. Peter will be selling some of his unique plants at the meeting so be sure to check them out and add a few interesting additions to your collection. This month’s opportunity table will consist of several 4”cattleyas donated by Fred Clarke. Many thanks to Fred for his generosity to our society.